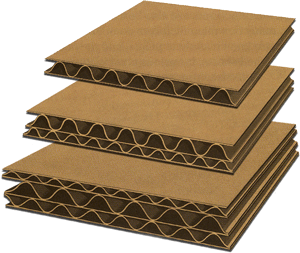 St. Marys Box Company manufactures corrugated cartons of all styles and will make a container to your specifications. When you select the grades of your package, you are setting the weight limit that your container will hold and ship safely. Some grades allow only 20 lbs. per box, while others can allow 3,000 lbs per container. For a quote on a box, please determine the length, width, height, and weight of your product then use our Customer Packaging Design Request Form. All of our ECT (Edge Crush Test) corrugated meets or exceeds the corrugated industry's Alternate Rule 41 requirements. Our sales staff would be happy to explain which ECT grade would best suit your needs. What is Singlewall, Doublewall, Triplewall?